India’s consumer market is in the sights of most multinationals, whose investors like to see “emerging markets" as one of the cornerstones of the strategies of these companies. That poses a challenge for HUL, which is the reigning king of the market. The most important battle on its hands is to regain volume growth and market shares. A period of high price differentials between it and competing brands led to consumers switching to the latter. High volume growth in its home and personal care products segments in fiscal 2009 created a high base effect too. Underlying volume growth for the company in the September quarter was just 1%. It will be under pressure to deliver—usually it is an outperformer in the Unilever Plc stable. Its parent Unilever went through the same volume decline that it did, but has pulled back, with volumes growing by 3.6% in the September quarter. If the trend in volume declines continues, then HUL’s results in the December quarter may not be all that great. But occasionally, retail sales trend data and company sales data diverge, especially during volatile periods such as the one we are seeing. Investors will hope that the company has better sales growth numbers to report. Meanwhile, P&G has launched Tide Naturals, which will compete with Rin in the detergent powder segment. As of now, there are no signs that P&G is going to start a bruising price war again. 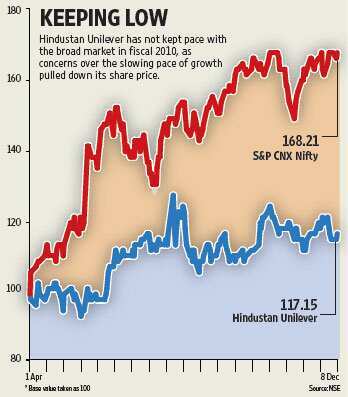 A longer-term competitor is a worry but will not immediately hurt HUL’s growth or margins. A key positive trigger will be improved volume growth, achieved without affecting its operating profit margins.